Whether you use it as a dip for your vegetable crudité, or dolloped on your fish fillet, guacamole serves as the perfect summertime accompaniment to any meal. The Mexican dish dates back to the Aztec empire in the 1500s, and has yet to lose its popularity. Spicy or sweet, chunky or creamy, guacamole’s versatility allows it to be used in endless ways. 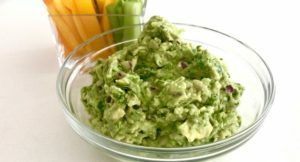 If you favor a traditional guac, try Tiffany’s recipe. For a high protein, reduced fat spin, try Lara’s Lima Bean guac, or if you want to add summer’s sweet corn, try Amanda B.’s Roasted Corn version. Finally, our summer intern, Amanda W., introduced us to her Sweet Pea guacamole and we are digging it. Regardless of which you choose, guacamole is loaded with vitamins B and E, potassium and fiber. It also provides a healthy dose of monounsaturated fat, beneficial for lowering cholesterol and providing nutrients to help develop and maintain your cells. Pick your favorite or try them all! Enjoy.